Alexander M. Rossi was born on the island of Corfu in 1841 and spent the early part of his artistic career in Preston, Lancashire, working at the local art school. From 1870 – 1873 he sent a number of paintings to London for the yearly Royal Academy exhibitions; among them were: A Family Group (1871); Anxious Moments (1872) and Past & Present (1873). By 1875 he had moved to Coningham Road in Shepherd’s Bush and would remain in the London area for the rest of his artistic life. 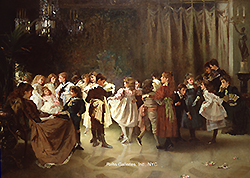 Like many of the late Victorian artists, Rossi specialized in genre paintings often centered on subjects involving children and young adults. These works were executed in a style that incorporated both the traditional Academy teachings and the avant-garde brushwork and colors of the impressionists. In all, he exhibited 66 works at the Royal Academy between 1871 and 1903 including: A Letter from the Camp (1882); A Cinderella (1885); The Little Lovers (1888); Caught in the Tide (1889); A Country Dance (1892); Dominoes (1895) and Forbidden Books (1897). 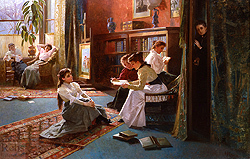 Rossi also exhibited 47 oils and watercolors at the Royal Society of British Artists between 1870 and 1893. He died in London in 1916.